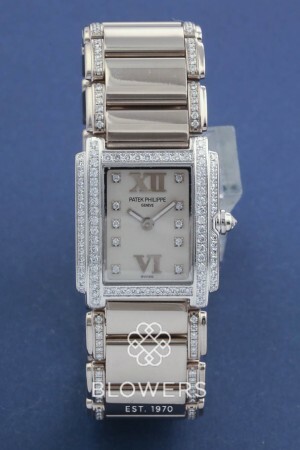 18ct White gold Patek Philippe Twenty-4. 4908/310G-011. Quartz Movement. 25mm case diameter. Silver dial with 10 diamond hour markers and Roman numerals 12 & 6.18ct white gold case set with 55 diamonds 0.63ct and 34 diamonds 0.13ct. White gold bracelet with concealed folding clasp. Box and papers dated April 2004. Service papers dated June 2018. Our reference S21033. SKU: 3034212. Categories: Patek Philippe, Twenty~4.